REVIEW: How much humor do you expect from an astrophysicist? How much passion? What should be the ratio of fact to fancy in the essays of a scientist? With Neil deGrasse Tyson, you get an enjoyable mixture of levity and reality on a subject that might hold the key to your future. Let me state at the outset that Neil deGrasse Tyson is smarter than me. Than I. Than me are. Than I is. (See what I mean?) And he’s probably smarter than most of us. Not just because of his degree in physics from Harvard and his degree in astrophysics from Columbia, or because he’s Director of the Hayden Planetarium. Well, okay, it’s mostly because of those things. But his articles and lecture appearances display more than knowledge and education — they demonstrate that the way one applies knowledge and education is of paramount importance. Here’s an experiment worth conducting. Sneak into the home of a NASA skeptic in the dead of night and remove all technologies from the home and environs that were directly or indirectly influenced by space innovations: microelectronics, GPS, scratch-resistant lenses, cordless power tools, memory-foam mattresses and head cushions, ear thermometers, household water filters, shoe insoles, long-distance telecommunication devices, adjustable smoke detectors, and safety grooving of pavement, to name a few. While you’re at it, make sure to reverse the person’s LASIK surgery. Upon waking, the skeptic embarks on a newly barren existence in a state of untenable technological poverty, with bad eyesight to boot, while getting rained on without an umbrella because of not knowing the satellite-informed weather forecast for that day. The series of articles and essays in this eye-opening book will alternately delight and anger you. Tyson writes of the great advancements humankind has made but then gently warns of the roadblocks we often construct for ourselves. Changes in the world have conspired to leave America in a less enviable position than in decades past. Some of this is not our fault, of course, but we share the blame in many areas. As the people of developing nations are maturing in outlook and the application of ideas and innovations, the reverse seems to be the case in the USA. In recent decades, the majority of students in America’s science and engineering graduate schools have been foreign-born. Up through the 1990s, most would come to the United States, earn their degrees, and gladly stay here, employed in our high-tech workforce. Now, with emerging economic opportunities back in India, China, and Eastern Europe — the regions most highly represented in advanced academic science and engineer programs — many graduates choose to return home. …science and technology are the greatest engines of economic growth the world has seen. Without regenerating homegrown interest in these fields, the comfortable lifestyle to which Americans have become accustomed will draw to a rapid close. Among the biomarkers in Earth’s atmosphere are ozone-destroying chlorofluorocarbons from aerosol sprays, vapor from mineral solvents, escaped coolants from refrigerators and air conditioners, and smog from the burning of fossil fuels. No other way to read that list: sure signs of the absence of intelligence. On our planet, there coexist (among countless other life-forms) algae, beetles, sponges, jellyfish, snakes, condors, and giant sequoias. Image these seven living organisms lined up next to one another in size-place. If you didn’t know better, you would be hard pressed to believe that they all came from the same universe, much less the same planet. Our tiny speck in the cosmos is quite amazing; we are all of us part of a miracle. Well, except for the troglodytes, naysayers, obstructionists, and all the regressive forces inhabiting the earth alongside decent folks. Tyson is extremely diplomatic in his essays but it’s obvious that conservatives — the anti-fact anti-science anti-progress folks — are mucking up so much of our world. In the essay entitled “America and the Emergent Space Powers,” his take-down of so-called Intelligent Design with a counter proposal called Stupid Design is a delight. Despite all the difficulties posed by the naysayers, know-nothings, and GOP mental defectives, Tyson appears to remain undaunted, calm, cool, and collected as he pushes us to realize our potential, to move forward as sentient beings in an almost incomprehensibly large universe. Yes, the world needs bankers and artists and even professional athletes. They, among countless others, create the breadth of society and culture. But if you want tomorrow to come — if you want to spawn entire economic sectors that didn’t exist yesterday — those are not the people you turn to. It is technologists who create that kind of future. And it is visionary steps into space that create that kind of technologist. I look forward to the day when the solar system becomes our collective backyard — explored not only with robots, but with the mind, body, and soul of our species. Time and again, Tyson shows that investment in science pays dividends in ways we cannot at first imagine. Increasing the funding for NASA will draw students to enter professions that help rather than hinder progress. 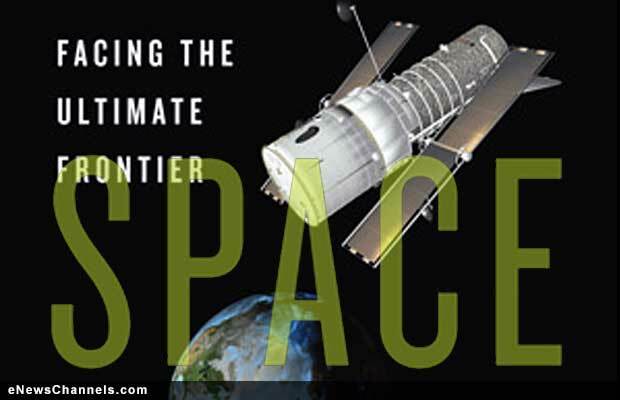 If you double NASA’s budget, whole legions of students will fill the pipeline. Even if they don’t become aerospace engineers, we will have scientifically literate people coming up through the ranks — people who might invent stuff and create the foundations of tomorrow’s economy. But that’s not all. Suppose the next terrorist attack is biological warfare? Who are we going to call? We want the best biologists in the world. If there’s chemical warfare, we want the best chemists. And we would have them, because they’d be working on problems relating to Mars, problems relating to Europa [one of Jupiter’s moons]. We would have attracted those people because the vision was in place. We wouldn’t have lost them to other professions. They wouldn’t have become lawyers or investment bankers, which is what happened in the 1980s and 1990s. When I track the orbits of asteroids, comets, and planets, each one a pirouetting dancer in a cosmic ballet choreographed by the forces of gravity, sometimes I forget that too many people act in wanton disregard for the delicate interplay of Earth’s atmosphere, oceans, and land, with consequences that our children and our children’s children will witness and pay for with their health and well-being. Eventually, if not as astronauts then as atoms, we’ll all be caught up in the blizzard of icy dust, the electromagnetic radiation, the soundlessness and peril that constitute space. Right now, though, Tyson is onstage, ready to usher us through catastrophes one minute and crack us up the next. Listen up, because living off-planet might lie ahead. Rather ominous, perhaps; but quite exciting, too. Kind of like science itself. 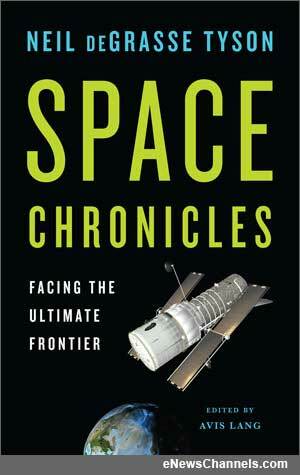 “Space Chronicles: Facing the Ultimate Frontier” by Neil deGrasse Tyson; W.W. Norton, ISBN 978-0-393-34362-5, 381 pages, $16.95. This original article is Copr. © 2013 by John Scott G, and originally published on eNewsChannels.com – all commercial and reprint rights reserved. Story illustration image based on book jacket created by Christopher Simmons. Editorial Integrity Disclosure: no fee or any other consideration was paid to this site, the site publisher, or the author of this unbiased review by any third party.